Alex Fohl and the Lady in Black are going to read a selection of poems written by Ed Webster who has published his first book: THE TAMING SHROUD. Webster’s photo-poetic work is about friendship, little secrets and battles, it is a story of love and freedom, an essay on hope and loss facing the question: What is left, when we are gone? 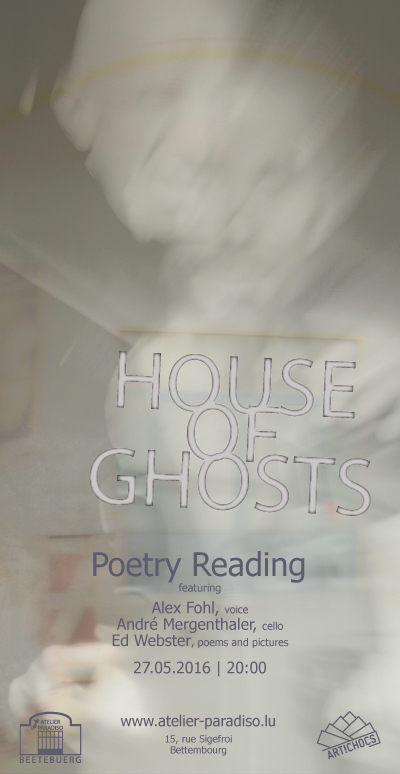 If you really want to find out, you should come and join the House of Ghosts on May 27, 2016 at 8:00 p.m. A couple of friendly hosts and airy ghosts will give you a warm welcome to a world of demons and spirits unfolding their obsessions, memories and dreams before getting swept away by the winds.